All the photos in my galleries expand and include captions located beneath the photos. So after owning this pocket camera for close to a year, and always concerned about loosing the very nicely finished metal lens cap that came with the camera, it happened,. I had hiked in to a location with my all-mode manpack where I had set up my portable station to work distant HF contacts. Later on while on the way back to my mobile, and carrying my pocket camera still mounted on the stake-pod, the lens cap came off and fell to the ground. Fortunately I noticed that it was missing within a few minutes, and although I could not find it at that time due to the size of the area and long grass it had fallen in too, I would return with my metal detector to find it. Once I had returned to find the lens cap, and upon returning home, I realized that it would be only a matter of time before I lost it again, and possibly for good. 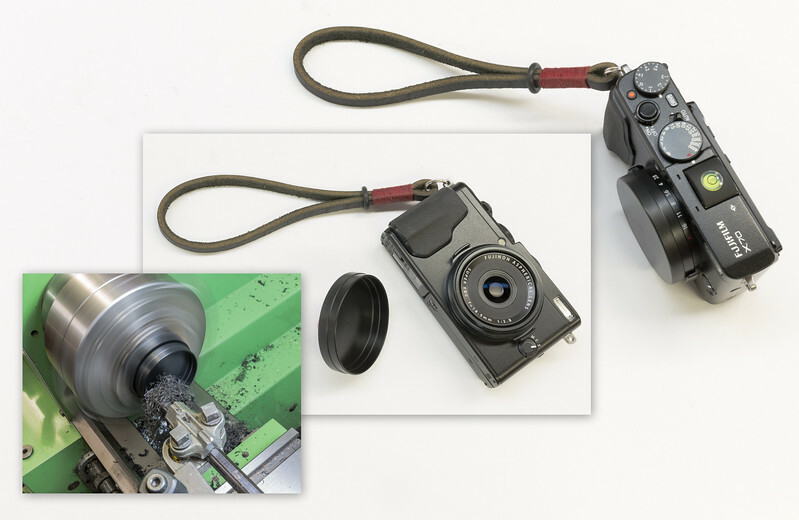 While doing research on the Internet as to the Fujifilm X series of cameras and the problem with how the lens caps mount on the barrel of the lens leading to lost lens caps, I realized that the lens cap needed to be redesigned. At that point I decided to place the original lens cap back in the box, and make up a new lens cap from black Delrin that would include improvements to how it mounted on the lens, making it near impossible to fall off on its own. With time spent in my workshop, I made up the replacement lens cap seen here. This lens cap fits beautifully on the lens of my pocket camera, and it is not going to fall off because of changes I made to the design allowing for a better grip on the focusing ring with its straight knurl that the lens cap mounts too. I'll bet my newly designed lens cap fashioned from black Delrin is a "one of a kind!"